It was the sweet, creamy smell that attracted me first to the shop.Yes, if it was not because of the smell, I would not have noticed the small shop. When my friend and I stopped at the red light, the smell was so inviting that my eyes ran around the area, searching for the cause. Then, there it was.Not far from where we stood, I noticed a little bit hidden, small cake shop. Colorful cakes and pies were displayed at the front of the shop and a lot of kind of biscuits and cookies were arranged at the side. All of them were glittering so shiningly in my eyes and the strong, sweet, creamy smell made me felt a sudden crave to eat something sweet. We went to the shop and struggled for quite a time. I did not know what to choose! 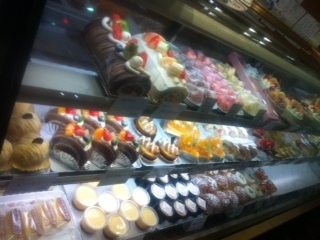 There were so many delicious-looking cakes to choose from. It is one of the oldest shop in the Obiyamachi shopping district. It was opened in 1924, about 88 years ago but the shop is so lively that the old age are barely seen.The shop is a bit hidden at the corner of the junction. So, it is not a wonder why most people do not noticed the small cake shop, but the strong smell of freshly baked cakes, biscuits and pies attract people who are walking there to turn their head around and take a glance.Then, they would see the cake shop with ‘Matsuya’ written on top of it in katakana. Many would say that all cake shops are the same. But that is where they are wrong. Matsuya has a history and reputation in Kochi. It survived from the war and the new century. 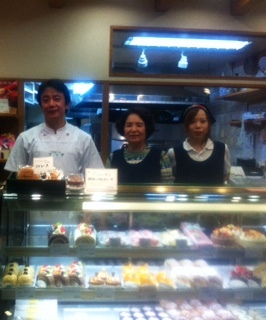 Even though, a lot of other cake shops begin to open years after, Matsuya still stands tall. Familiar faces stop by, take their time to think which to choose and buy their cakes. I believe nobody ever gets tired of it because I never have. I always buy the same packet of chocolate chips and a piece of strawberry cake. I also love to try other cakes that I have never eaten before. So, I always ended up with two pieces of cakes. Japan is well known for family business with the oldest one being the famous Hoshi Ryokan which is located in Ishikawa and was founded in 717 of Nara Period. There are a lot of family business shops that are being managed generation by generation in Japan. They prefer to take the risk and open a shop that sell things that they like or that can help the daily life of the people around them. For example, bakery, restaurant, ryokan, electrical shop, pottery workshop, clothes shop, food stall and Japanese traditional sweets shop. Unfortunately, with the recent development of technology and the fast-spreading chain shops, a lot of this family business shops, like Matsuya, are facing problems in their sales. Shopping malls are built here and there while chain shops, like Starbucks ,McDonalds, Jusco and Doutor, are gaining a lot of profits in their sales than the local shops. Most people prefer to buy at this chain shops because it is considered more high class or better than the local ones. The brand also influenced people’s choice. If a person found out that the white blouse that she have been eyeing for at the racks of the well-known shop, GAP has a similar design and materials with the one she saw at the local shop near her house, which one will she buys? Would she buys the GAP one because her friend might ask about it or the local ones just because it is cheaper and she do not care about it? Lots will be surprised to know that a lot of people may choose the former instead of the latter. Matsuya is also one of this ever-changing society victims. Most of people may have thought of Matsuya when they had wanted to eat cakes, 50 years ago. But nowadays, they may prefer to go to the nearest convenience store to purchase a piece of cake or just stop by and eat at one of the family restaurant that serve varieties of cakes. Day by day, this local shops are being forgotten and soon after they have to face the crisis of bankruptcy. However, it is kind of surprising that after all this years, this small cake shop survived even though the world around it was changing so fast and so much. This may due to the fact that the cake itself was a new kind of dessert in Kochi when it was brought in. And though it’s long been in the family, the shop will soon pass to different, though familiar hands. What really make this Matsuya’s cakes so special? The fact that they sell their cakes just exactly how they did when they first opened the shop, make them very special. That is without the help of any technology or machines that are used in most shops nowadays. Everytime I stop by at Matsuya, it is the same routine. My eyes will keep looking at the cookies on the rack and then back again at the cakes. The fresh, sweet smells, actually, are the one that always keeping me from making all the decisions. All of them smell so tastefully and look so yummy. I will take my time in choosing and eventually end up with two type of cakes and one packet of chocolate chip cookies. I will be smiling by myself, at the thought of eating them, all the way home. Yes, I am a fool for cakes and I would not mind to take the train for about 15 minutes from my house just to buy their cakes. Matsuya’s cakes and not others.It will be great if they still can survived 88 years and more. Matsuya did not think continuing so much. I really loves cakes and biscuits in Matsuya! I always buys them especially the chocolate biscuits whenever I go to Obiyamachi. Matsuya had survived long enough and I think that their business will be standing still. That is an interesting article! I enjoyed your article 🙂 When I went to Matsuya with you, I was sure that you like a cake. And I think you found good Japanese Shinise-store! however I want to buy the cakes so it looks nice pictures and I enjoy your article. I was glad to go to the interview with you. I didn’t know much about the shop so it was very interesting to read. I want to try more cakes in Matsuya! I have never been there, but I want to go there, because of your article. It must habe been difficult to keep the long history because of war, chain-shops, so it is surprising for me that the family are having kept Matuya for 88 years. Your not a fool for cakes. I love them as well so I have to make an effort to stay away from these shops!